The idea of network rendering, or distributed rendering, is to distribute your render over a network, or farm, of computers, to speed up your render times. This can be done in many different programs with a myriad of different setups, so it isn’t as straight forward and clear cut as I’d like it to be. Creating the right storage and management can be a challenge but it’s important to get that in place first. There are tons of resources out there but I’m keeping this short and sweet so this will be a page of resources more than actual instructions. If you have a great resource, let me know. If you’re a vendor and you’d like your information added or updated, please contact us. aerender is a command line rendering set up for After Effects. The aerender application can be used for running a render farm on multiple computers and it can also be used for batch operations on one computer. There’s a full section about Automated Rendering and Network Rendering in the Adobe After Effects User Guide and comes with After Effects. Network rendering works best on a very fast network with rapid connectivity to storage devices. Ty Audronis explains how to set up a render farm properly. He says not to mix up Macs and Windows on your network. Stick to just one OS due to problems with plug-ins. RenderGarden is a script for After Effects that will help you increase your render speeds on one machine but also lets you render faster with hyperthreaded rendering on each network render node. Plus, you do not need to have Creative Cloud serialized to run aerender. Simply follow the directions above to enable Render-Only mode for aerender, which doesn’t require you to sign into your Adobe account. Nexrender is a tool for render automation for Adobe After Effects that also allows users to set up a render network and render several projects simultaneously. I wrote up a feature in December, C4D Spotlight: Setting Up A Render Farm in Cinema 4D with Team Render, which was what actually prompted me to update this article. In the article, I talk about how Team Render replaced Net Render in R15 and that Team Render is fully integrated into Cinema 4D, making it very easy to set up a network render. 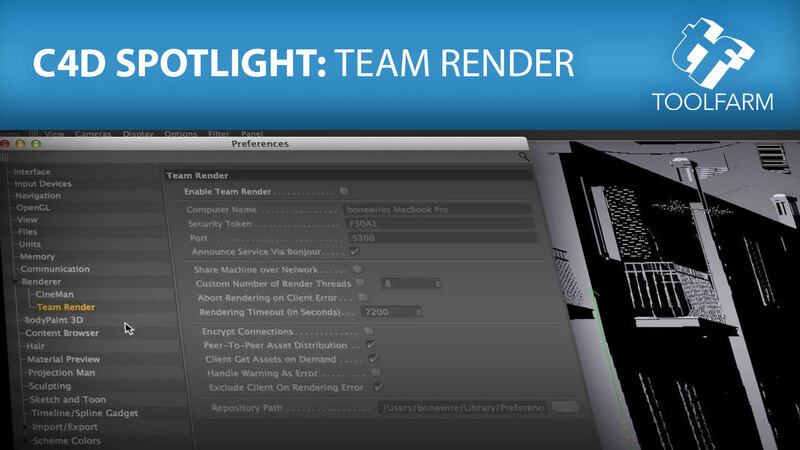 CINEMA 4D – Render: Team Render (Setup) – This is a quick visual guide from Maxon, walking you through the steps of setting up Team Render. Turn Your Old Computers Into A Render Farm For Cinema 4D With Team Render – Nick from Greyscalegorilla explains how to use Team Render for a Cinema 4D render farm. Autodesk Backburner is a free render manager from Autodesk that allows Autodesk users to network render. It’s for Mac, Windows, and Linux. Where is the download for Backburner for Maya? Not exactly a render farm tool or a tool that you render with in any way, but it will help with syncing plugins, maintaining, optimizing and troubleshooting over a network for Final Cut Studio, FCPX, Avid, and Adobe Premiere Pro! Ramma is not a tool to help with setting up your render farm, per se, but I’m including it because its purpose is to spot corrupt, dropped, or non-contiguous frames in rendered sequence and it works over a network. This could save you from so many render headaches! If you’re a developer and your information is out of date or needs to be added, please email Michele at Toolfarm. Network rendering requires that the plug-in is installed on all machines that are participating in the rendering. Render nodes do not require a license. Just having the unlicensed plug-in installed is sufficient for the machine to render a scene that was prepared on another machine. Neat video: Full license purchase must be made for each render use. Multi-user licenses are available. A single-user license allows you to install and activate the full version of After Effects on two computers, but users can install an unlimited number of After Effects CC render engines on computers without using these two activations. Network Rendering support with Autodesk Backburner. Render Farm Support – AXYZ offers credit for RebusFarm, Ranch Computing, Renderflow, RenderNation to all new anima customers. Boris FX, Inc. Continuum Complete – Free to Customers on Latest Version. Render node license support in software via RLM floating licensing server. Mocha Pro – A new Render License option allows users to render projects on a networked render farm or different workstation without taking up a full license. A 1 Year Unlimited Network License is available. You can network-render using Autodesk Backburner and Thinkbox Deadline, or use Corona’s integrated DR solution. Free install on all render-only computers. Digital Film Tools software is set up for free rendering on render farms. When a user is using an After Effects Render node to render a project that contains DFT filters, no license is needed for rendering on the Render node machines. Cycles 4D Render Nodes are available for purchase. There are regular licenses and network licenses available. In Network license mode, a pool of licenses is available on the server, for use in any computer on the network. You only need to have licenses for the maximum number of simultaneous users expected, not for each computer where the software will be installed. KeyShot Network Rendering comes with 32 cores for the Enterprise license only. Network rendering nodes start at 32 cores for $480. The number of slave machines is limited to the number of cores. 256 cores are the largest offered but they can work with you if more cores are needed. Learn more at the bottom of the Details tab on the KeyShot page. Amleto is a Lightwave 3D Network rendering controller that is on GitHub. Pixelan Software allows for a free install on all render-only computers. Red Giant Software Magic Bullet Suite, Red Giant Software Primatte Keyer, Red Giant Software Knoll Light Factory – These products come with a faceless render-only version of the software, this can be installed on each render-only machine and does not require a serial number. Synthetic Aperture gives you a free install on all render-only computers. Video Copilot Element 3D: It is possible to use Element on a network render farm but we do not recommend or support it because of inconsistencies of GPU rendering. Since Element renders with impressive speed on a single GPU it is ideal to pre-render any 3D elements before pushing to the render farm. However, Zaxwerks 3D Invigorator Classic: does not work across a network. 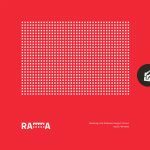 29 January 2018: Ramma information and RenderGarden news. 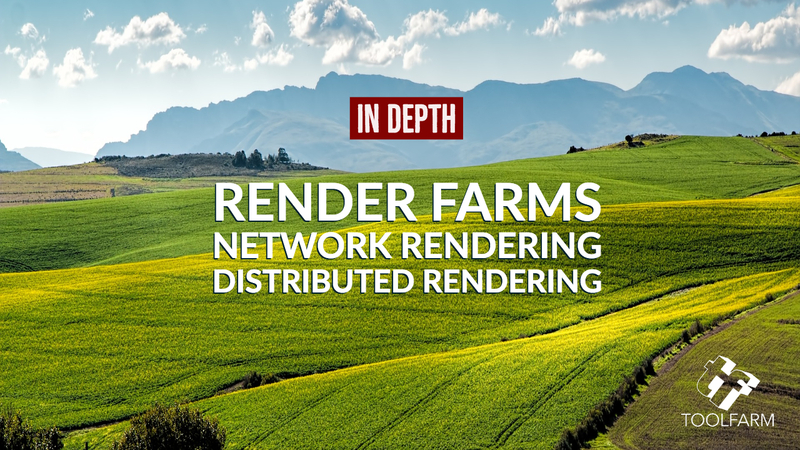 Late 2017 In 2015 we produced a very popular article on Render Farms and Network Rendering. A lot has changed since then, so this is a followup with new information.